Hello everyone, I hope you're doing good. I'm heading off to Hamburg in the morning so before I go, I thought I'd share a project that I recently finished and photographed to appear in a big magazine later this year - my little boy's updated bedroom! 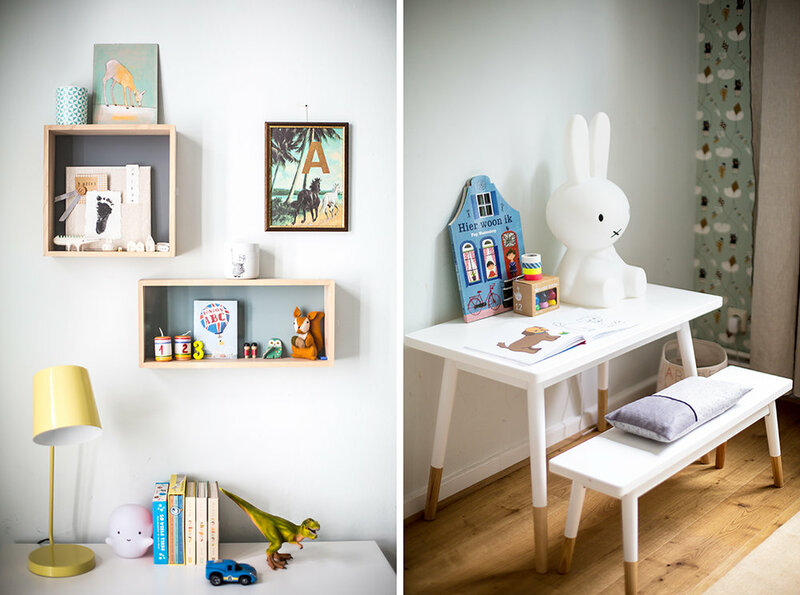 I took it from being a baby nursery to a room fit for a three-year-old boy complete with a new bed, some new art, a drawing table, new rug and a few other things you may spot that are a little different from before. I love how it came out. I've not changed much in his bedroom since I designed his nursery (before and after here) but I did exchange his crib for the beautiful Wood Day Bed from Oliver Furniture (which we love) and I added a small table with a bench from Bloomingville along with a Bloomingville wooden toy box on wheels (not shown). I also mixed new rugs, linen curtains, new bedding, a few new cushions and I switched up the art on one of his walls. So I guess I did change a few things! It really needed a facelift and he was so happy when he saw the finished results! I imagine his room will stay this way (more or less) for another 3-4 years, and then we'll update again with new wallpaper on the back wall, new paint, new scheme... But for now, this room is definitely made to grow with him. Ready to check out his updated room with my 8 steps? It's very gender neutral, so it's great for a boy or girl! Switch out the crib with an adaptable, quality bed. I didn't want to buy a toddler bed, then have to buy a twin bed or a full bed a few years later, too much shopping! We opted for the Wood Day Bed from Oliver Furniture because it's made very well, handmade in fact, and is a beautiful Danish design so if he tires of it in a few years, it will fit beautifully into my guest bedroom where I currently have a very boring twin bed. This day bed also has an organic allergy-free mattress and an extra insert to extend the current mattress with any extra peice, so when he is taller, the day bed grows with him - the frame pulls apart and you place in two new railings. Then it's the length of a normal twin size bed. Update the bedding. 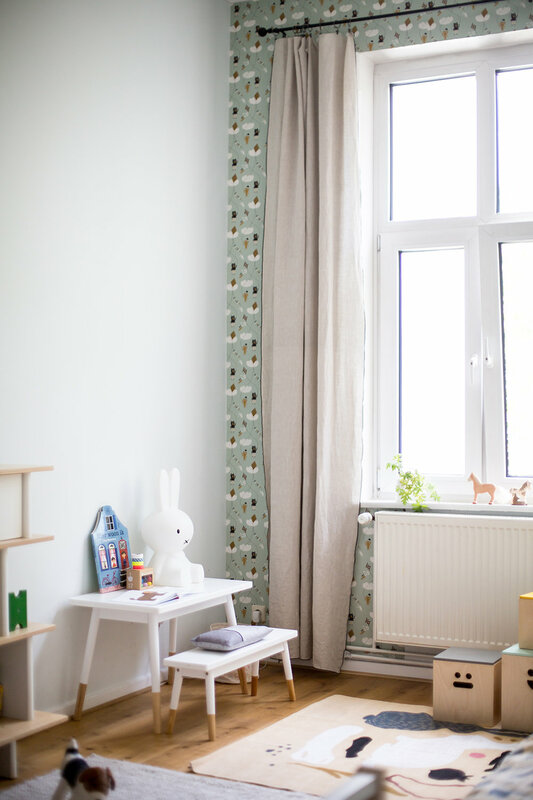 This is such an easy but dramatic change because the modern bunny pattern still works with the wallpaper yet makes the room look like it's a for an older child now and not a baby. Update the art. Also easy. 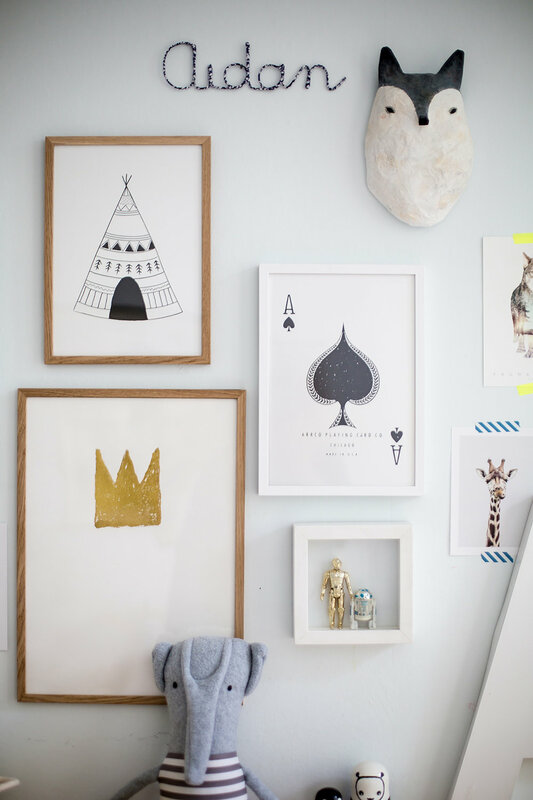 You don't have to change or get rid of everything, of course, but swap out prints and just move things around. The papier mâché mask went from over his changing table to above his bookcase. The wall chart stayed because he still likes it and I knew when I first put it in his nursery that we could keep it for years before the cars and superheros posters take over. Some of the art I just taped to the walls with washi tape just as before when I put together his nursery. Washi tape lasts for years, at least the MT Tape brand, so prints won't fall off the wall no matter how humid or cold the room gets. Add curtains that hang to the floor. I like these because they are linen and light, but also block out the light even during bright daylight. I opted for a black trim on the curtains to make them look a bit more grown up so he'll hopefully keep them for years and if he doesn't, I can easily pop them into the guest room or another spot in my home. I always think like this when I shop - where else can I use the item if I tire of it in the room I'm buying it for today? It's a great thing to do when you shop, especially for the investment pieces like drapes. Can you imagine them in another room or reimagine as a shower curtain, cafe curtain, pillow covers or a bench cover? Work table - a must! A baby isn't able to sit on a bench and color but a little child loves being creative so give them space to do so in their room on a little table, mine is from Bloomingville. I have two benches for this table but the other one stays in the guest room with plants on it for now, but when he's friends come by and they all want to sit at the table, I can pull the second bench out and they can go at it. He also loves that he can pick up the bench and move it around his room. He likes to move it below his window so he can peek outside throughout the day. New rugs for playing. I picked up a flat weave rug so he can race his cars on it and also be comfortable since the floors are hardwood, but I also exchanged the fluffy flokati rug I had in his nursery for a flat surface, but still cozy to sit and place legos on. You can't play legos on a deep, fluffy rug! I imagine I'll change the rug again in a year or two, but this one was under 100 Euros and can go into another room in my home or I can give it away to a friend. Flexible dresser/changing table top. I was THRILLED that I ordered a changing table/dresser combo from Oliver Furniture before he was born because the changing surface came off easily and now he still has the lovely white dresser that he's had for over three years now. I lost the handles though (I took them out when he was crawling and emptying out the drawers constantly) and haven't found them since so now I am looking for new pulls. But other than that, the dresser is still in beautiful condition and we really love it. He can keep this dresser for years and years, and it's wood so we can paint it black when he goes through his teen angst years or whatever. ha ha! Restyle things. Move stuff around and add in new things that your child loves and plays with. Don't be afraid to move out the baby stuff - even if you can't part with it yet, store things someplace until you are ready to pass them on to another child or maybe your own next child! I switched around things on his bookcase and on the shelves over his dresser that paint of a picture of his life today. His shelves now have more personal things inside included his wrist band from his birth, birthday candles, gifts from friends, things I've made, his belly button clamp from infancy, etc. Now for a little shopping list! Also, you can shop more of my favorite things for kids at Bitte where I have my very own shopping page set up. Thank you so much Oliver Furniture for donating the beautiful bed and to Bloomingville for the table and bench - and to all of my readers, if there is anything I've missed, please let me know. I'm so happy that I could share this space with all of you today - it makes me so proud and is truly one of the happiest rooms in my home.